Home » Autoimmunity » Is Autoimmune Disease Reversible? Are there things we do today that someday will seem “crazy,” just like bloodletting? I look at treating autoimmune disease with long-term use of powerful immune suppressing drugs (which have a ridiculous list of side effects such as infection, cancer, cardiovascular disease, bone disease) like bloodletting. For those of you who know me, you know that reversing autoimmune disease is a passion project of mine. Not only did it almost kill me 7 years ago… but it actually killed my mom back in 2005. It’s important to point out that in this model, even if the non-self antigen (bacteria or virus) triggering the attack is removed, the autoimmunity never turns off, so the body continues to produce antibodies and attack healthy tissue even though the initial trigger is gone. Again, with this model, even if the bacteria, virus, or gluten that damaged the tissue is removed, the autoimmunity never turns off, so the body continues to produce antibodies and attack the exposed tissue even though the initial trigger that damaged it is gone. Researcher Alessio Fasano, M.D., has been on the forefront of recent autoimmune and Celiac disease research. In 2011, he published a paper titled, “Leaky Gut and Autoimmune Diseases,” introducing a new theory that suggests prevention and reversal of autoimmune disease is possible. In the case of Celiac disease, the genes are HLA DQ2/DQ8. In Rheumatoid Arthritis they are looking at HLA-DRB1*0401 in mice. 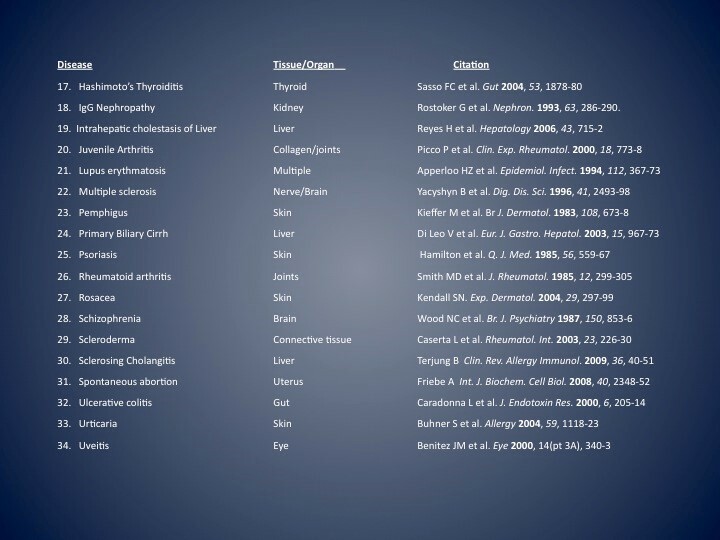 Hashimoto’s Thyroiditis was associated with various HLA genes that differed in populations. Caucasian populations were associated with DR3, DR5, DQ7, DQB1*03, DQw7 or DRB1*04-DQB1*0301 haplotype. Japanese populations were associated with DRB4*0101, HLA-A2 and DRw53. In Chinese studies, associations with DRw9 were observed. In Celiac disease, the environmental trigger is gluten. In Rheumatoid Arthritis, there is a strong correlation between cigarette smoke and the onset of diseases. But how do they meet? Turns out, it’s in the gut. That means we must fix leaky gut. I’m not saying someone with Celiac disease can ever eat gluten again or that someone with a completely destroyed thyroid can get off medication. I know, because I’ve been there too. 7 years ago Celiac disease almost killed me. You could spend years trying to figure out how to “fix” your immune system… or you could register for this free, one-hour webinar and we’ll show you how we did it. I registered for the 3/28 webinar and received a confirmed msg. but never received the link and cannot access the webinar. Now, I’ve registered for the next one in April. Still have not received the link for that one. How do I get the link after registering? Hi Helene – please send us an email at lorijo@scdlifestyle.com and we’d be happy to help you! Hey guys! The first step in healing from any autoimmune disease is fasting! 3 days of no food to start. Research it! Thank you so much for having an article and not a video! What a blessing. I can chew on the info as I see fit and process! Blessed by this!!! I was very surprised that diabetes 2 and Alzheimers (diabetes 3 according to some practitioners) are not included in this discussion especially given the research of the last 18 months, the glymphatic system, the breaches of the blood-brain barrier due to leaky gut and the now known 5 types of diabetes 2. Having said that this seminar is about scd which is maybe not the best for diabetes 2? Hi I have been diagnosed with myasthenia gravis in 2015.Currently I am in remission .Rt now the doctors are weaning my Prednisone.i will be undergoing thymectomy.will fixing the leaky gut help me with myasthenia.pls advise. Could you please send me a copy of the webinar as I live in Australia and wil be asleep at the time. I have registered to aftend, like you instructed someone else to do with a similar request. HI Denise – thanks for reaching out! Each person that registers will receive a replay the next day, so you can watch it when it’s convenient for you.Just email us at support@scdlifestyle.com if you have any trouble accessing the replay and we’ll be happy to assist! The syndrome, just like many autoimmune disorders, comes on after a viral infection or a physically or emotionally traumatic event; the syndrome is often put in association with leaky gut syndrome and intestinal permeability, like autoimmune disorders; and it develops slowly and symptoms start gradually, but when you do develop symptoms they seem to quickly get worse (only sometimes). These three are also characteristic in many autoimmune diseases, especially systemic ones like rheumatoid arthritis, Sjogren’s syndrome, Hashimoto’s disease and type 1 diabetes. I am interested to know whether or not you would view fibromyalgia as an autoimmune disease? Also, while I’ commenting I’d like to ask, I had the Epstein-Barr virus when I was 13, and developed fibromyalgia a year later. What I want to ask is what autoimmune conditions can be triggered by this virus, and can this virus trigger autoimmune diseases years later after infection due to it staying in your body? Can it trigger type 1 diabetes, Hashimoto’s disease, or any other systemic autoimmune diseases, even if years have past since infection? Hi james – these are great questions, and while the experts are researching the, no definitive answers have been found yet. We do consider fibromyalgia to be an AI condition, and many experts now do as well. Hopefully there will be more conclusive answers in the next few years. In the meantime, we know that healing the gut can help manage ALL autoimmune conditions, so that is where we are focusing our energy! Hi Mariel, thanks for replying to my question. Getting diagnosed with fibromyalgia was extremely hard for me, because every specialist I went to would say the same thing; that they don’t feel happy “labeling someone so young” with fibromyalgia. This was back in 2012. In the end their’d be steam coming out of my ears because they would write a letter saying I was symptomatic of fibromyalgia, but at the same time they were not going to label me with it. I went to various rheumatologists and neurologists, until finally one neurologist diagnosed me after doing all-sorts of tests, including pressing my “tender points”, which hurt so much I screamed once, and by the end of the test, I was crying and collapsed when I stood up, all from the pain of the tender point press. The staff were lovely; they helped me to a chair, got me a glass of water, I was shaking. When I could walk again, I thanked everyone for all their support and generosity and got to my mums car and we went home. After the tests, I had a letter saying he wanted MRI’s, blood tests and all sorts, and after that he diagnosed me, but also said my blood test came back with very high levels of inflammation and very low vitamin D levels. I was so glad to have someone diagnose me. Obviously I wasn’t glad to have an illness, but was glad to be told it wasn’t in my head. I had people who had told me it was in my head, and one even said I was a burden to my mum for “playing” on my symptoms and “milking it”. To be honest I see fibromyalgia as neurological more than rheumatological due to it’s symptoms and their nature. What about you and the team? Do you view fibromyalgia as neurological or rheumatological, or something else? Hi Lori, thanks for your reply. I am actually going for a blood test next week to see what my current levels of inflammation are (as my last test was in 2012 and I keep getting otitis externa). I will let you know if you want by email what the results were. I take a lot of medications, and surely that is going to increase gut permeability? Could the long-term use of medications; specifically anticonvulsants, antidepressants and corticosteroids, lead to (or increase) leaky gut syndrome? Ofcourse, I blame Epstein Barr virus for kick-starting most of my problems judging by the timing, but could those medications I just listed also lead to leaky gut, or make it worse? Hi was wondering if arthiritis can be reversed if the damage was from a vaccine. I had an mmr vaccine the day after having my baby which i refused several times and angry for a long time but that was exhausting so i just want to know if it can be reversed. I have bad aches in arms and hands and a little in legs. Does any1 have any insight. Doctor tested for ms and thank god it was negative. I did read it could be new mum syndrome however pain is bad so think it could be vaccine damage. I have a diagnosis of primary biliary chirrosis. Can you help to stop it or reverse it. My sister has a diagnosis of lupus. My other two sisters are unwell showing signs of chronic fatigue or fibremialgia. Hi Martina – I’m sorry to hear you’re struggling right now. At the webinar you’ll learn more about how the gut and autoimmune diseases are related and actionable steps you can take to feel better right now. These are classified as autoimmune diseases as well. Will the SCD/GF diet work? I was allergic to milk as a baby, I had acne as a teenager. Now I have rosacea and i get bloated with certain foods My daughter has type 1 diabetes, and has adhd. I had gestational diabetes with 2 of my children and I have ADHD. My sister has Chrohns disease and has rosacea. My sisters son has aspergers. And her daughter has exema and her other daughter has celiac disease. My mom had RH. I have hashimotos and psoriatic arthritis and inflammation, which all resolved on a gut healing diet, however after 2.5 years it became harder to maintain the diet and now everything came back, so even if my gut was healed, it is leaking again. Is it impossable for us to eat grains and sugar ever? I am only eating very small amounts and still mostly scd and never take drugs or antibiotics. What brings about the leaky gut in the first place? Hi, I’m from India and I was diagnosed with Clinically Isolated Syndrome this January. Every blood test that I took turned out to be normal. Are there specific tests that I need to undergo to understand my gut condition, how is my gut related to demyelination. Should I undergo FMT? Hi Alakshendra – thanks for reaching out to us. I have heard that IBS is a localised spectrum autoimmune disorder. Is this case? I started getting unwell after chiropractory and deep tissue massage. I felt unwell within minutes after the massage and I felt sure that my immune system had been triggered to attack. I had at least nine or more months of persistent fatigue after very little exertion along with joint/muscle pain which does come back every so often when I think it has gone for good. I have always called it ‘the other thing’ since it was never diagnosed. At one point I wondered if it was Fibromyalgia. I then developed costochondritis and IBS. All this happened within months of each other. I also found out that these three conditions are linked. Hi Phillippa – I’m so sorry to hear what you’ve been going through!! IBS is like a blanket term used to describe a set of symptoms rather than an actual illness. Often doctors will tell you you have IBS when you have symptoms but they can’t diagnose you with another disease (like Celiac Disease or Crohns) Some people have IBS symptoms as a result of an autoimmune condition. I hope the webinar helps give you a better understanding – and you can always reach out to us with more questions afterwards. HI Audrey – thanks for reaching out to us! Type 1 diabetes is an autoimmune condition – and we interpret some newer research to suggest that all autoimmune diseases are impacted by the health of the gut. Great article, something i have been looking for for a long time. What if somebody has EBV virus that triggered autoimmunity. The gut is not leaky but EBV exist and there are high levels of antibodies against EBV. Would not even attempting to fix the gut would not get rid of the EBV as ebv is already inside the body? Can you calm down the EBV somehow? Hi Bart, thanks for commenting! This is a really interesting topic. I have horrible rosacea flushing, without breakouts, that seems worse after eating. I have always had digestive disorders. Will this be addressed? Thanks for your question Andy! I recommend registering for the event as Jordan and Steve go into the causes of all of this and offer solutions to fix it once and for all. I have suffered with alopecia areita sine 19, now 51. Sorry to hear that denise! Let us know if we can support you in any way. Would the SCD diet work for Bile Salt diarrhea post cholecystectomy? Hi Becky, thanks for reaching out! The SCD diet is meant to heal the gut lining and decrease inflammation with in the body. There are many things one can do in addition to stopping the diarrhea and we encourage you to start with changing your diet to the SCD diet or a plaeo type diet. ho I’m really looking forward to the seminar, but I have a few questions. First how long is the seminar and do we automatically get it sent to your email if you can’t attend? Also I have an undetermined autoimmune disease , as I have various neurological issues such as uveitis as well as brain and spine lesions, and they are questioning possibly a rare condition called Susacs Syndrome, do you know if leaky gut is associated with this particular Autoimmune disease ? Thank you !! Thanks for the article and free webinar. 4 in my direct family have Ankylosing Spondylitis, and some in my extended family. Not much is mentioned about it. Very interested in seeing the outcome. I missed the registration and the webinar. I have psoriasis and have been tying to control it with supplements. I’ve not had an enormous amount of success. Can you provide me some clues on how to reverse autoimmunity? Hi – I’ve registered for the seminar – and got a text last night…but how do I access it tonight? Thanks! Looking forward to the webinar! 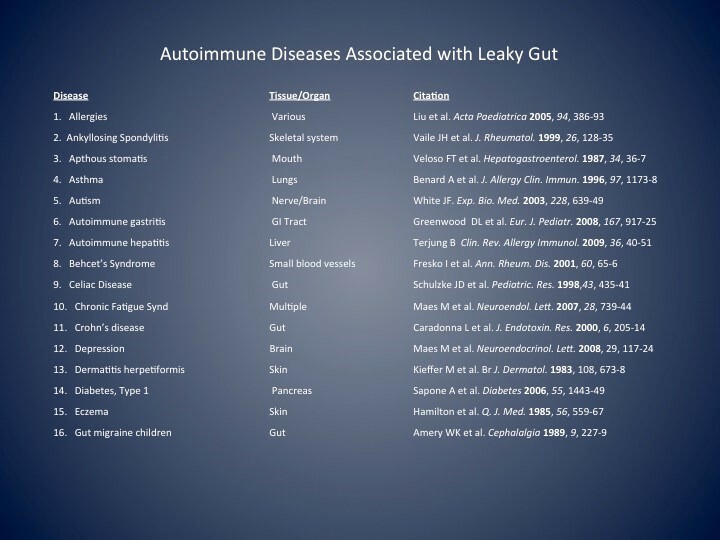 I noticed Sjogren’s Syndrome (which I have) wasn’t mentioned in the AI associated with leaky gut list. Is there a connection between the two? Hi Rachel, thanks for reaching out! It is our belief, which is backed up by research, that healing the gut is going to be important in helping any condition one may have. We highly encourage you to listen in and learn about how the gut impacts all AI diseases. Question: I didn’t see the rare condition of myestenia gravis (sp?) on the lust of autoimmune issues in the article. Can you comment on leaky gut and this disease? Or if you have any research on holistic treatment with the gut, if be greatful to read something helpful for a friend . Hi Shawna, thanks for reaching out! We do not have any specific articles on this exact disease, but I highly encourage you to register and listen in, as healing the gut is going to important for helping any condition. Hi Priyas, thanks for reaching out! Go ahead and register for the webinar, as the replay will be sent the following day and you can listen in this way. Great article – thanks for all the information and research you guys provide. I have just recently discovered via blood test that I have 2 of the celiac genes. I have suffered with many food intolerances over 10 years, and pretty sure I have leaky gut – traditional doctors are clueless about this. This webinar will be really helpful to me. I’m in Australia – so hope I can access OK.
Hi Val, thanks for reaching out! You should not have any issues accessing the webinar, but please let us know if you do and need assistance. Why not just put the video on YouTube? We prefer to host the webinars this way over YouTube – but the webinar is totally free. Do you know of any studies that have tried to determine environmental triggers for Hashimoto’s? Great article. I have Hashimoto’s and believe leaky gut was a root cause. Just ordered a uBiome gut test since traditional doctors don’t address the gut. Hi Ben, we are glad to hear you are taking action! Isn’t fibromyalgia considered an autoimmune disorder also? I didn’t see it on the list. My sister-in-law has had so many health problems over the years (acid reflux, migraine headaches, digestive problems) and now has developed fibromyalgia so bad that she is confined to her bed most of the day. She is taking medications that I feel are just making things worse. Have you every heard of fibromyalgia being reversed? Hi Shelley, thanks for reaching out! Fibromyalgia is a controversial subject, as some do not believe the disease exists due to the fact that often times doctors come up with this diagnosis when they do not know what else it could be. We have had success in those seeking improvement for pain management, mood, and energy levels, just to name a few. We highly encourage her to listen in on Wednesday and begin to at least change her diet and heal the gut. Please have her evaluated for Lyme even if she never remembers a tick attachment. Research the connection to fibro and so many other conditions and how poor the testing is. So many people who have the symptoms and diagnosis later find out it was from Lyme. Shelly, for your friend: my Lyme doc in Missouri said that most fibromyalgia patients are undiagnosed Lyme patients. Have western blot IGG and IGM tests done at IGENIX LAB in California. They have the most reliable results than most because of their testing criteria. Then get on the eatlng and supplement program recommended by Jordan Rubin and Ty Bollinger and others for Leaky Gut. Almost all chronic disease is accompanied by leaky gut. I can tell you from experience how much better I feel following that program.